› You need more examples in your report. › You might want to use a lighter baseball bat. › You should have included some Essential Questions in your unit plan. As coaches, teachers, and parents, we too often jump right to advice without first ensuring that the learner has sought, grasped, and tentatively accepted the feedback on which the advice is based. By doing so, we often unwittingly end up unnerving learners. Students become increasingly insecure about their own judgment and dependent on the advice of experts—and therefore in a panic about what to do when varied advice comes from different people or no advice is available at all. If your ratio of advice to feedback is too high, try asking the learner, “Given the feedback, do you have some ideas about how to improve?” This approach will build greater autonomy and confidence over the long haul. Once they are no longer rank novices, performers can often self-advise if asked to. › This is a weak paper. › You got a C on your presentation. › I’m so pleased by your poster! These comments make a value judgment. They rate, evaluate, praise, or criticize what was done. There is little or no feedback here—no actionable information about what occurred. As performers, we only know that someone else placed a high or low value on what we did. You’ll soon find that you can drop the evaluative language; it serves no useful function. 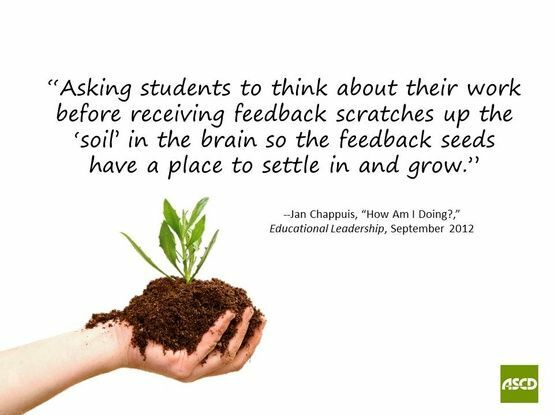 The most ubiquitous form of evaluation, grading, is so much a part of the school landscape that we easily overlook its utter uselessness as actionable feedback. Grades are here to stay, no doubt—but that doesn’t mean we should rely on them as a major source of feedback. Although the universal teacher lament that there’s no time for such feedback is understandable, remember that “no time to give and use feedback” actually means “no time to cause learning.” As we have seen, research shows that less teaching plus more feedback is the key to achieving greater learning. And there are numerous ways—through technology, peers, and other teachers—that students can get the feedback they need.